Given the right conditions, a vegetable garden will yield a year-round supply of fresh produce. You can extend the growing season by sheltering plants from frost in early spring, late fall, and even winter. There are several options for protecting crops against cool weather. Your choices depend on the amount of time and money you want to invest. Cold frames and row covers are the simplest, least expensive structures for protection from the cold. Cold frames are raised beds that are covered with a glass, fiberglass, or plastic cover. They shelter plants from wind and use the sun’s heat to warm the soil. They’re also useful in hardening off seeds before Spring planting. The ideal location for a cold frame is a south or southeastern exposure, against a North wall that will provide further protection from the elements. Placing the bed on a slight slope will help with drainage, and sinking it into the ground will provide further insulation. Low-tech materials, such as bails of hay or bricks placed in a square and topped with a storm glass window, make a perfectly functional cold frame. A plastic window cover is another light-weight, portable option that can be moved from bed to bed, or nailed to a wood frame. Cold frame kits are available from several sources. I purchased this wood frame with plastic and metal cover from Gardener’s Supply and was delighted to find pak choy and spinach sprouting happily under several inches of snow. Unfortunately, this particularly cover tends to blow off in a strong wind. A more elaborate wood structure is not difficult to build and is more permanent. If you are building a wood frame, use pressure treated cedar or plywood. Buy alkaline copper quarternary (ACQ) treated lumber in lieu of chromated copper arsenate (CCA) or ammoniacal copper arsenate (ACA). Whatever method you chose, you’re sure to have an extended harvest. Prepare the coldframe about a week before you’re ready to harden off Spring seeds. Hardening off is the process of acclimating plants that were started indoors to the harsher light of the sun and cooler outdoor temperatures. Place seedlings in the coldframe for gradually increasing lengths of time until temperatures are appropriate for transplanting into the ground. In spring and summer, you can start young seedlings in a shaded frame many weeks before they’d ordinarily be ready to set out. 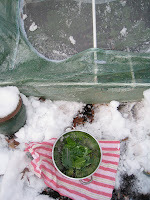 You can also start cool season crops in the shelter of a cold frame. Make sure your coldframe is ventilated and irrigated, especially when winter temperatures reach 45 degrees. Depending on the harshness of the weather and a gardener’s ingenuity, an ambitious Northern Virginia Gardener can have fresh veggies year round. Very useful info! I love the idea of having fresh green vegetables in the dead of winter.